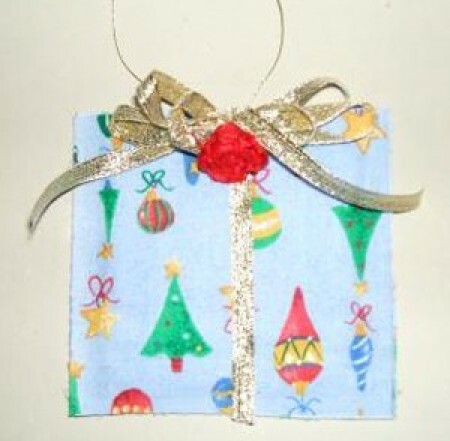 These sweet scented ornaments are great for decorating the tree or for giving as gifts. They are also great bazaar sellers. Fuse 1/2 inch wide strips of fusible web to each edge on wrong side of 1 fabric piece. Center batting on wrong side of fused piece. Place a few drops of essential oil on batting. With wrong sides facing and raw edges aligned, place remaining piece of fabric on top of batting. Glue ribbon, rick-rack or other trim on package, as shown in photo. Embellish by gluing on a ribbon rose, heart shaped button, etc. For hanger, fold piece of gold thread in half to form loop and knot ends. Glue knot to top back of ornament. Let dry.